I am continuing this darn sweater.. (finally) although I'm aching to start something *else* new... I cast on the sleeve and while it seems HUGE at the cuff, I'm not comfortable with making it smaller because I think I would have to make other random complicated calculations in the pattern to make it fit at the shoulder. I am just taking a deep breath and hoping that it all fits and works out. I was fighting with myself thinking that I don't really want a plain boring half zip green sweater anymore, but I realized also that if I were to add some colorwork (like a fair isle band on the arm) it'd look funny the way it attaches, or if I put it where the sleeve connects, it'd be really low on my arm... 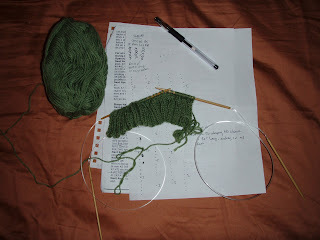 So I am sticking with my initial idea which is to make a simple green (boring) sweater. It's full of "beginners" mistakes (I am still a beginner) but I'm learning. Slowly. It's obvious that I haven't gotten to the chapter about gauge swatches yet... I'm still in the "fake it" stage... I think of my knitting habits a lot like the I Love Lucy show where she's working at the chocolate factory - just "acting" like she knows what she's doing... I do know a little; and I do know better than to work on projects and assume they're going to fit when I don't do a gauge swatch... and while this sweater seems a tiny bit big, I think it'll be OK. I hope to get one sleeve complete this weekend. I got a few responses for the yarn swap I offered - I am waiting for one or two more replies with the answers to the questions we posed - then I'll be matching each person with a pal. Hey - this is the way I started out with the 'increase on the 5th and then every 7th row until'. At first I lived in fear of losing my bit of paper, but as I got more proficient and more confident I found I could do it just by making a mental note of what row I was on with the pattern and working from there. Stick with it - the more you do the better you get. Someday you will learn the value of making gauge swatches. Until then, you're walking on thin ice! Once you know your gauge, you will be able to know WITH CERTAINTY the finished size of all your knitting. Then there is no guessing, and hoping "it works out right". There is no such thing as accidents: everything results exactly the way you do it! But hey! knitting is cheap entertainment, so if you have to do it over 2 or 3 times, well so much the better!